Ever wanted to know what government agencies can find out about you thanks to telecommunication Data Retention laws? In telecommunications, data retention refers to the, often temporary, storage of phone records and Internet traffic by commercial organizations like phone companies and ISPs. Data types and retention time differs from country to country, but all can be used for traffic analysis to create a tracking profile. German politician Malte Spitz managed to receive six month worth of data from Germany's largest telecommunication company Deutsche Telekom. He forwarded the information to Zeit Online, a German newspaper, which used the information to create a detailed tracking profile of the last six month of the politician. Geolocation information were linked to Internet activities like Twitter messages or blog postings. 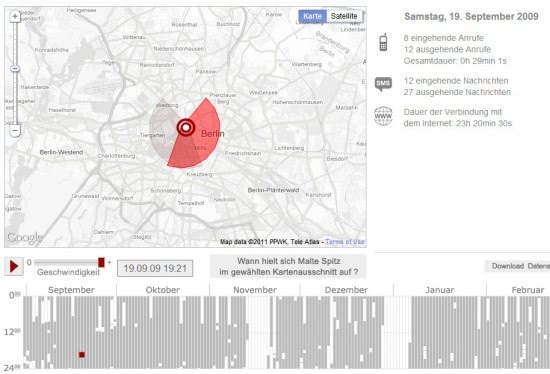 The tracking profile uses Google Maps to display information about the politician's location at any given time during the six month period. Information about incoming and outgoing calls, SMS messages and connection to the Internet have been made available as well. It is for instance possible to determine exactly when and where calls where made, and how long they lasted. Please note that Zeit Online is a German website which means that all texts and information are in German. you can click on the play button to see the movement on the map. The Geschwindigkeit (speed) slider can be used to decrease or increase the speed. Take note that the location can be determined to the minute. The tracking on the map appears to be detailed enough to determine the location at any given time providing that the user is in the country. Now imagine you have additional data at your disposal: to be precise, of everyone. You could establish connections between people, for instance by comparing call logs but also locally by comparing movement profiles for example over a period of time. Head over to Zeit Online to play around with the tool. My vote goes to Creepy.